Boxercise - how does it help you tone and shape your body? Train fast and have fun with Boxercise. Can Boxercise help you get the body tone you want? Read on to find out more. If you want a great physique is Boxercise the right training method for you in Dubai, Abu Dhabi or Sharjah? 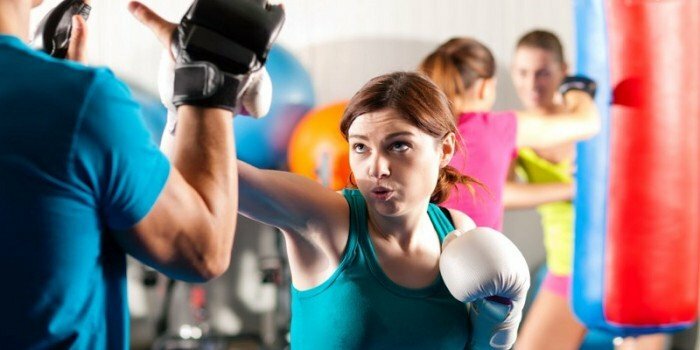 In the UAE Boxercise is a relatively new fitness method that can be done on a 1-2-1 personal training basis or for more fun as part of a Boxercise for fitness class. There are many benefits to doing Boxercise – just look at how fit professional boxers are! Boxercise is a fairly new term in the fitness world. As a personal trainer in the UAE who offers Boxercise can you describe what it is? Boxercise is an exercise class based on the training concepts boxers use to keep fit. Classes can take a variety of formats but a typical one may involve shadow-boxing, skipping, hitting pads, kicking punch bags, press-ups, shuttle-runs and sit-ups. As no class involves the physical hitting of an opponent, it is a fun, challenging and safe workout. The controlled and specific movements in Boxercise require a great deal of focus, so much so that trainers actually say that it can improve your concentration and discipline. If you’re feeling tense or stressed, Boxercise is the perfect way to let all that go by channeling your aggression in a safe and controlled manner. Even though Boxercise is non-contact, you will feel more in control of your body, and certainly more relaxed and de-stressed after a class. Boxercise is the ultimate combination of strength and cardio, so after a few classes you may start to find that the excess pounds are melting away. The classes take the form of HIIT (high intensity interval training) where you combine short bursts of intense exercise with recovery periods – the very best method for losing weight. Boxing itself requires quick movements, which encourages your muscles to develop, and Boxercise takes this element and incorporates it into the classes. But it works your whole body over, from your arms, back, legs and core. How does Boxercise help with body toning? Are there any particular moves etc that target specific areas of the body? The high-intensity nature of the workout means that you burn fat quickly, and the quick succession and repetitive motion of the movements tones your muscles. Boxercise is a thorough full-body workout, which focuses on more than just the arms. This class involves upper body conditioning, which tones and strengthens the core, as well as cardio training, which improves stamina and heart functionality. As a result, Boxercise is a sure-fire way to achieve a lean, toned body. You’ll also improve agility, stamina and co-ordination, all while burning hundreds of calories. Boxing is extremely taxing on the core. Your hips need to rotate in order to get full extension and deliver a more powerful blow. And since you’re burning more calories than you would lying on the floor for isolated abs work, you’ll be ready to show off that flat belly sooner. A boxing training session involves every muscle in the body, but especially the core and the shoulders. A good boxing workout tones your legs, arms, chest, shoulders, back and helps you build a strong core – so yeah, that’s pretty much everything. For anyone interested in Boxercise in Abu Dhabi do you think it is suitable for all ages and abilities? Boxercise training is for everyone, classes are aimed at men and women of all ages and fitness standards, whatever your size or shape. Remember, every boxer will have started from ground level, so anyone and everyone can work their way up to a good level of fitness. It’s also a great sport for overweight children, and it also helps build self-esteem and respect in young people who may be bullied or lack physical confidence. What exercise kit is used in Boxercise for body toning in Abu Dhabi & Dubai and do people need equipment at home? In the Boxercise sessions we use gloves and pads, both of them are provided by the instructor, we suggest each client get your own wrap (for hygienic reasons) to protect your hands, wrist and thumbs the wrap is very important to support your wrists as punching can cause wrist strains on impact. But if it is the desire of the client he can have his on gloves. Gloves are usually weighted depending on your body weight so look out for this when purchasing it. It is necessary to find a balance between the duration of cardio workouts and the intensity. If the exercise is on high intensity, then the optimal duration can be only 20-30 minutes for each session. However, If the exercise is of moderate intensity, your optimal duration will be 30-45 minutes. With low intensity, it is likely that the duration will be 45-60 minutes. Each of these exercises can burn a similar amount of calories due to different levels of intensity. And instead of fat in the fire of metabolism, the blue flame burns protein amino acids. After two hours of cardio, the body loses up to 90% leucine (an amino acid that predetermines muscle growth). For optimal fat burning, usually three days a week for 30 minutes with sufficient intensity to burn at least 300 calories per session. After you can complete basic training, if you want to burn more calories, speed up your results or break a plateau, you can increase the frequency of cardio sessions up to 4-6 days a week. At the end it should be noted that in spite of constant cardio exercise you cannot lose fat. Because there will be no attention to the diet. An example – two doughnuts – will replenish your body with 600 kcal which equal to hour running on the treadmill. Thus, solving the problem of fat reduction – diet is in the first place. What would you say are the Boxercise routines for toning the arms and upper body? Boxercise is an increasingly popular class that combines boxing with fitness. A general conditioning class with plenty of fun elements of boxing where we have a big focus on arms and upper body. We also use punches on the pads as the main part of the training sessions you going to feel your arms burning in a few minutes after start the . Designed to involve plenty of padwork with elements of fitness to teach the clients how to box, have fun and get fit. In this situation arms and upper body are working all the time. Boxing is a high repetitive workout, it results in toning rather than building muscle. Circuit and HIIT style workouts specific to boxing and all bodyweight so the clients do not need any special equipment. These are short killer boxing drills designed to quickly finish off the clients so they feel like they’ve had an awesome workout. Short and simple abs workouts to finish off the class. Fitness classes like Boxercise are a great way to add some fun to your overall fitness regime. On the UAE Personal Trainers website you will find the best male and female boxing coaches in all areas of Abu Dhabi, Dubai and Sharjah.